Beauty is estimated to be between 23 and 25 years old. She’s recovering at the Easy Horse Care Rescue Centre after being seized by police along Costa Blanca in Spain. An elderly mare being thrashed by thugs in southern Spain has been seized by police and has found sanctuary at a horse rescue centre in Rojales. San Javier Police rescued the severely injured and thin old mare on March 9, taking her to the municipal vehicle depot before calling Easy Horse Care Rescue co-founders Sue and Rod Weeding. Although local police are trying hard to protect animals, they don’t have the facilities to house large seized animals. Fortunately, the centre was able to take her. Sue Weeding has decided to call the old mare Beauty because “she’s surely never been told that she’s beautiful”. 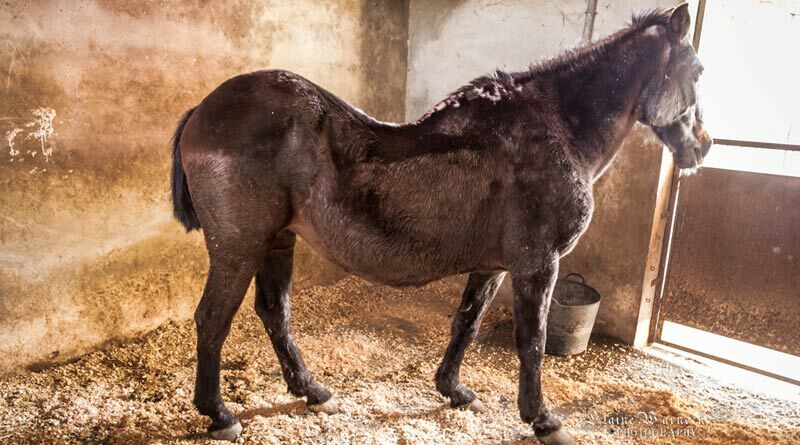 The mare – whom the centre’s equine veterinarian Dorothea Dudli von Dewitz estimates at 23 to 25 years old – has horrendous spinal scars, likely caused by an ill-fitting saddle. She also has a sway back, possibly from being ridden hard at a young age. Beauty has horrendous spinal scars and a sway back. Beauty’s suspensory ligaments have lost elasticity and are collapsing down. The centre’s 113th resident will require a pair of special shoes to relieve her old legs. Beauty has settled in well at the centre and is enjoying her food and already looks brighter, although she’s still nervous around people. “How on Earth could we have said ‘no’ to saving this poor old soul?” Sue Weeding asked. The Easy Horse Care Rescue Centre relies entirely on donations to fund its important animal welfare work, including the feeding and care of the centre’s more than 100 horses, ponies and donkeys rescued from abuse, neglect and abandonment. It receives no government funding. Beauty was being beaten by thugs when she was seized by police along Costa Blanca in Spain. Donations of cash or items for the centre’s network of six charity shops across the Alicante province are welcomed. A pick-up service is available to collect large donated items such as furniture and each shop also offers a delivery service for large items purchased in-store. Located just outside Rojales at Partido Lo Garriga, 59, the Easy Horse Care Rescue Centre opens to the public on the first Sunday of every month between 1pm and 4pm. A free tour begins at 2pm and there is a café on site. It is the only officially registered horse rescue foundation in Spain. Anyone interested in making a donation, becoming a long-term sponsor, or volunteering at the rescue centre or in the charity shops can call Sue Weeding on 652 021 980.